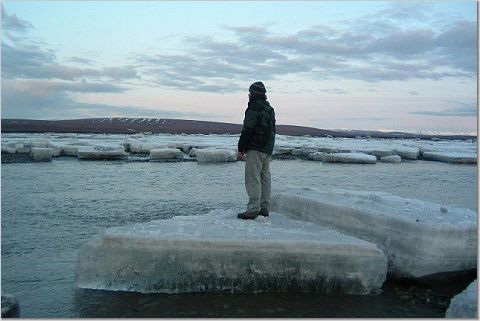 It occurred to me today that this week would be the tenth anniversary of the day I first set foot in Alaska. Of all of the moments in life to commemorate, this is one that stands out for me — a turning point, or point of no return, depending on how I look at it. I had to dig through the very old archives of the Wayback Machine to find the exact date — May 30, 2003. Three friends and I had been meandering north for almost a month, living out of a 1990 Ford Econoline Van with a custom roof, retrofitted electrical wiring and the high luxuries of a television, cell-phone based dial-up internet connection (as in, we actually plugged our laptops into a phone) and a small refrigerator. Perishable food was hard to come by in the north, we were discovering, and the fridge stayed mostly empty except for foil-wrapped Dolly Varden and grayling that we pulled out of tiny streams in British Columbia, and cans of Pepsi that I insisted on keeping cool. After a month on the road I was only starting to conceptualize what a big continent North America really is, and the past week had instilled a sense of isolation via a bewildering expanse of black spruce forest, birch groves, and snow-capped mountains over the farthest horizons. Towns came in flashes of log buildings and gas pumps, and then they were gone. The sun wasn't setting until midnight. I thought I had experienced remoteness after days of backpacking into desert canyons in Utah — but when that feeling came via motorized transportation on a highway, I knew we were really out there. But the place had a sameness to it as well — endless miles of black spruce forest, birch groves, and snow-capped mountains — and after a month I was starting to feel road-weary. "Everything moves slower out here," I wrote. "The sun, the time, the progress of life. The end of May. Everyone has hit a one-month lull. The novelty has worn off. This is our life now. Putting up tents and making pancakes is our job; the remote dirt road through this continuous expanse of wilderness is our commute. " 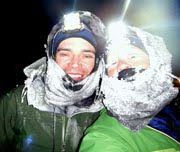 We spent much of May 30 lingering in Dawson, Yukon, where we camped on the edge of the Klondike River so Chris and Geoff could pan for gold. They used Frisbees from our kitchen stash — the same ones we used as dinner plates in camp — and were quite serious about the endeavor, squatting in the cold water and sifting through mounds of sand and gravel that they'd hauled from the hillside in stuff sacks. "I walked up the hill and surveyed the remaining buildings – collapsed and corroded wooden cabins leaning over the steep slopes above the creek," I wrote. "The gold rushers once lived here. The people that traversed barren snowfields in the rigid cold of endless night, seeking a dream. I’d like to think I’d do the same, but I’ve never had a dream so intense, so overpowering, as to drive me into the glacial dark with only a faint glimmer of hope for success." I smile now, when I read this, thinking back at the wide-eyed naivety of 23-year-old me. If only she knew. "Chris and Geoff gave up on their dream after about 45 minutes, minuscule flakes of sparkling 'gold' still stuck to their legs and arms, mud dripping from their hands. Discovery is not preemptive. This is the frustration of gold panning. This is the frustration of traveling. At this moment we drive along the Top of the World Highway, across the Yukon River and less than 50 miles from the Alaska border. Our destination. And perhaps the cause of our discontent. We could turn the van around right now and never be the worse for it. There may be nothing on this horizon save the reluctant sun, but we’ll never know until we go." There wasn't a bridge across the Yukon River this far north, so we crossed on a ferry, standing just outside the van as the boat plied across the silty water. On the other side of the Yukon was a narrow, dusty gravel road that spat rocks into our open windows as we rumbled higher into the mountains, truly the top of the world. Crossing the border was anticlimactic — just another tiny outpost lined with thick alder groves and more black spruce. Alaska looked a lot like everything else here in the far north. But we were back in the United States and there was a feeling of coming home. But not quite. I'd lived in Utah for most of my life, and the feeling of homesickness was strong in those final days of May. I remember daydreaming about redrock cliffs, missing the suburbs, and imagining the West Desert in November while we traversed a brown and white patchwork of tundra, still locked in winter in early June. I didn't yet realize that the roots of my homesickness would shift, and ten years later, I'd be out on a highway en route to Utah, daydreaming about those first days in Alaska. "The landscape here is diverse and frightening; it commands joy but demands respect. Everything borders on extreme – daylight, temperature, seasons and life. Survival out here is also extreme, something I don’t feel adequately designed and conditioned for. My body is too weak and too susceptible to sun and bug bites, too unaccustomed to hunger and thirst and cold. Maybe this is the cause of my nostalgia for strip malls and suburbs. However, it is also the cause of an extreme respect and fascination with this place they call the Arctic Circle." ...The people that traversed barren snowfields in the rigid cold of endless night, seeking a dream. I’d like to think I’d do the same, but I’ve never had a dream so intense, so overpowering, as to drive me into the glacial dark with only a faint glimmer of hope for success." Interesting thought, do you think it is because we don't have too? If you didn't have a job back then, you didn't have food, for the most part. What did they have lose? Can't say the same for most people born into middle class America today, even if the middle class is shrinking. I do think though you see this same desperation (if only different outlets) in the inner cities, where the feeling of "nothing to lose" leads to a high risk life style. Yup, I feel like when it comes to Alaska, you write from inside my head. I have to admit, the weird quirkiness of living in Humboldt is kinda growing on me too. It's fun picturing little 23 year old Jill writing in her journal about the big world. "Survival out here is also extreme, something I don’t feel adequately designed and conditioned for. My body is too weak and too susceptible to sun and bug bites, too unaccustomed to hunger and thirst and cold. Maybe this is the cause of my nostalgia for strip malls and suburbs." WOW! Do you look back and chuckle at the 23yr old Jill? I read that excerpt and think to myself "that is SO not the Jill I (we) all know, and I've been following you since Juneau. It's like the 'you' you've now become is the Anti-Jill from that 23yr old. I look at most of your 'expoits' now and think that I am the one who isn't "adequately designed" for things. Anon — actually, a large number of people who took part in the Gold Rush were part of the middle and upper classes. Passage to Alaska and supplies were expensive. Some people gave up everything they had to go north, but for the most part those who didn't have some level of comfort back home couldn't leverage enough funds to go to the Klondike. The Gold Rush wasn't about desperation, it was about opportunity. It was about greed, and it was also about adventure. A huge majority, something like 90 or 95 percent of the miners, returned home with little to nothing to show for their efforts. Flat broke, in many cases. So while I can understand what you're getting at, I think you're attaching your sentiments to the wrong historic event. Those Gold Rushers were similar to modern explorers and adventure racers, leaving their comfortable and settled lives behind for a raw and potentially dangerous adventure, despite the ultimate futility of it. When I read the stuff I wrote at age 23, and even age 17, I have this sense that I really haven't changed that much. I'm still writing in my little journal about the big world. :-) I don't necessarily see myself as stronger now than I was back then — just older and more experienced, and more enthusiastic about pushing against limits. I wrote that last entry shortly after returning from a backpacking trip were I was so savagely attacked by mosquitoes that I gave very serious consideration to jumping into the Koyukuk River (which was flowing near flood stage) and trying to swim across. I probably would not have survived that swim, and I had no other choice but to endure the slow alder-shwack with hundreds of mosquitoes swarming me. So I was feeling very weak and vulnerable, and in many ways I have not changed when it comes to my fitness in the wilderness. Jill, I just hope you stay young at heart and keep nurturing your penchant for adventure. It is inspiring and refreshing. Your story is inspiring to young people around the country. The thrill of Alaska. being one of this great country's last great frontiers, stimulates the imagination. Thanks for the inspiring blog. I'm planning my first trip to Alaska this summer :-).